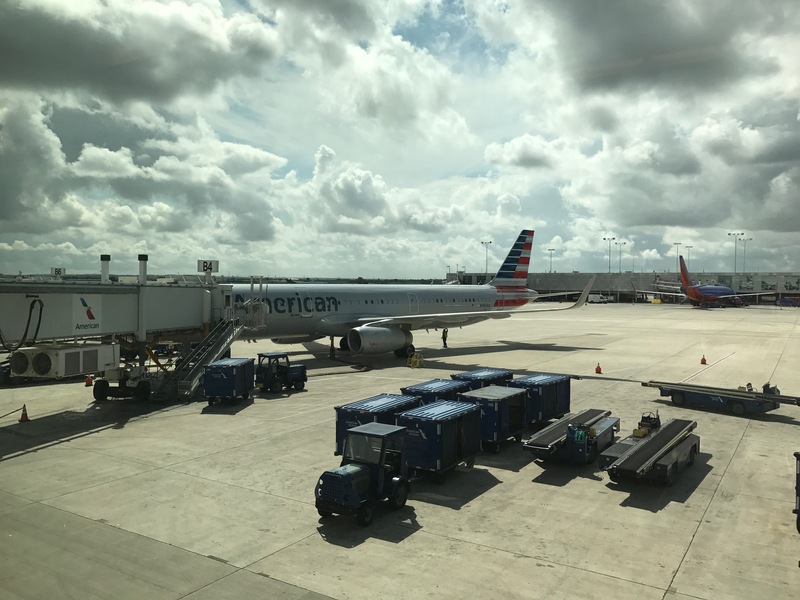 The brilliant weekend in San Antonio came to a close and it was time to head home the same way I’d come, via Dallas / Fort Worth and Philadelphia, to Manchester. A bit of a trek, but as it was only £1,049 return, and I really couldn’t argue with that. London is actually home for me, but Manchester being only 2h 20 minutes on the train meant it was not hugely inconvenient. After a short Uber ride to the airport, and a quick chat with the check-in lady, I walked through a completely empty TSA check-point, with happy smiling agents. Wish it could be like that all the time! It was a short mosey to the gate where the previous flight was just pushing back. After perhaps an hour chilling at the gate area (there’s no Admirals Club, but there is an United Club), my aircraft, a slightly smaller A319 arrived. Boarding was swift, take-off uneventful and after a glass of water, it was soon time to land in Dallas. I mentioned in one of my first blog posts that one of the tools I pay for is Trip It. 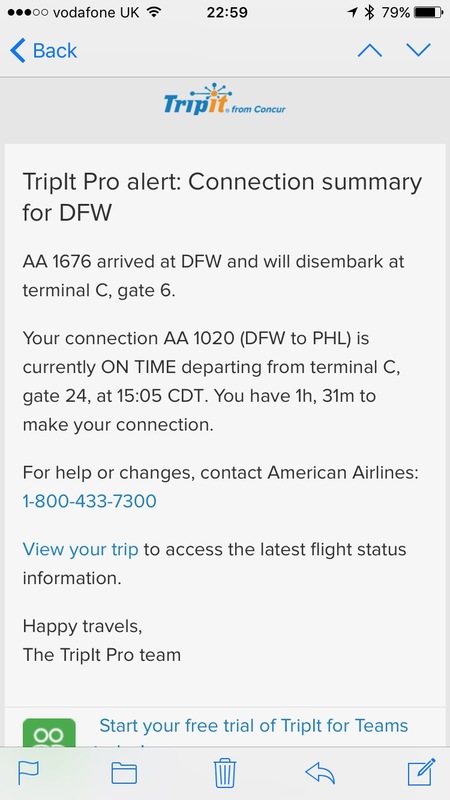 As soon as I touched down I got my connection summary email – very useful for somewhere like DFW. All very useful. Time for a gin and tonic in the Admirals Club before heading down to the gate. Which is exactly what I did. Just about the time to head down to the gate, my phone pinged with a second email. Oh dear. As much as I enjoy a good run, I’m not sure 8 minutes from one end of Philadelphia to the other was going to be terribly productive, not least that they close the gate 20 minutes prior for international flights. I wandered up to the counter at the Admirals Club and the lovely guy there agreed that it probably wasn’t going to work. I suggested simply putting me on to a direct flight back to London, to which he said sure. Using Expertflyer, I’d already checked that there were free seats on the next flight, the BA192. After a few minutes tapping away, he was done. 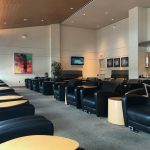 As BA uses a different check-in system, he explained that he couldn’t check me in, but should head over to the lounge over in terminal D, and they would be able to do the honours for me. I also asked the agent for the British Airways record locator, and used the BA mobile app to ensure that my Executive Club number was correctly in the system so that miles and points would credit correctly. Unfortunately it wasn’t possible to allocate myself a seat, so I gave the Gold Guest List telephone number a call, thinking they would be able to. Now it transpires that they only have access to the reservations system. They don’t have access to another system called “Fly” which in the trade is known as a Departure Control System (DCS). The very helpful agent agreed that this would be very useful, but it was seen as “far too dangerous” to give them access. This is exactly the point that I touched upon in a previous article; British Airways doesn’t enable its team to help passengers when things go wrong. They’re more concerned about protecting revenue, than helping their customers get where they need to go. However when I got over the lounge the lovely agent there was able to check me in and allocate a seat. Again, using ExpertFlyer I’d taken a look at the seat map and noticed that a number of the seats on the upper deck were blocked, but free. I asked if she was able to unblock one of them to move me upstairs. After a quick call to Ops, I had a boarding pass with 62B on it, an aisle seat upstairs. I still had a couple of hours to wait so settled in the BA lounge for a bit. 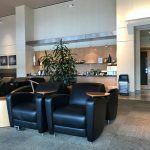 The lounge that BA use is operated by the airport, quite large, with waiting staff all around who will serve drinks on request. I asked for a Champagne and was given a quarter bottle of an American sparkling wine which was pretty terrible. I decided to head off and wander over the Admirals Club next door instead. There they have the Flagship First Dining Room which is open to Oneworld Emerald customers too where they had the real stuff (Taittinger) available instead. Before I knew it, it was time to head to gate D15 and board the 747-400 and head back to the UK. 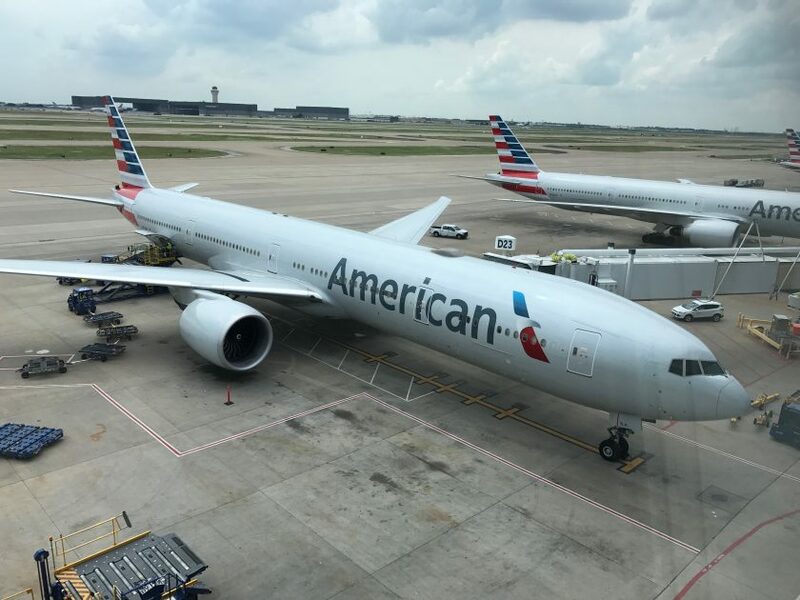 It turned out that AA managed to recover some of the delay to my original flight to Philadelphia, and I would have landed with 45 minutes to make my connection. 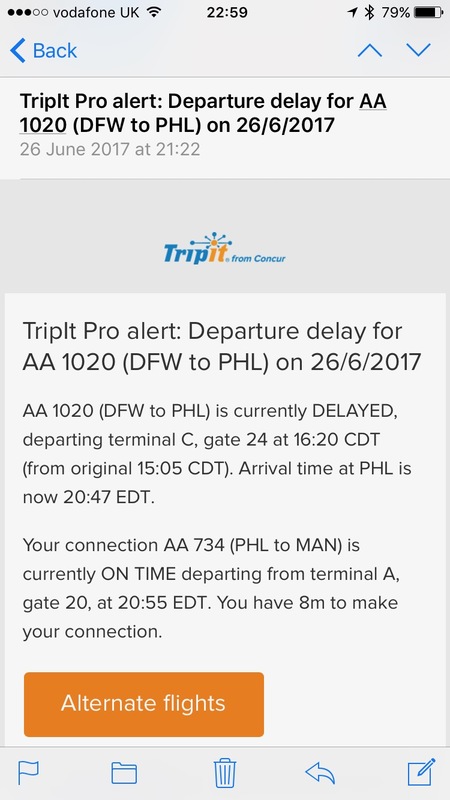 Tools like TripIt and Expertflyer are invaluable when things go wrong. More often than not, if you suggest something reasonable to the agents, which is convenient to you, and you know there is space, it makes their jobs many times easier to rebook you. Previous Post: Fare deal. £1,550 London to Rio.